‘CAFAM’ is an acronym for the Central Academy of Fine Arts Museum. Theme of the 1st CAFAM Biennale, 2011 is ‘Super-Organism’. The CAFAM Biennale is founded on a broad vision of contemporary culture, and it references the framework, structure and unique characteristics of international biennales, from a Chinese cultural standpoint, and utilizing the academic research background of the Central Academy of Art, it attempts to explore historical and literary issues, emphasizing the creativity and conscious nature of art as it explores the vanguard in cultural thinking, research and exhibition modes, constructing an international platform for academic research and artistic dialogue. The CAFAM Biennale will address the most pressing issues in contemporary art, inviting curators, artists and experts from across the world to conceive and participate in the exhibition, to produce and exhibit art works, join in seminars and produce publications. Furthermore, with the goal of making the exhibition a social and cultural event, CAFAM will work to facilitate and encourage the student community and the public in attending generous programming featuring interactive and educational events. 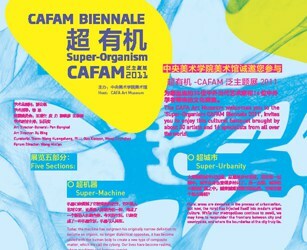 The theme of the inaugural CAFAM Biennale in 2011 is ‘Super-Organism’. Interrogating thought processes and human habits related to material desire (or the elimination of those desires), ‘Super-Organism’ attempts to outline notions of the surreal in contemporary society. The theme will unfold around the notions of ‘machine’, ‘urbanity”, ‘body’ and ‘bio-politics’.